Okay, I admit it: I’m a sucker for the Olympics. I watch with rapt attention to sporting events that I would otherwise never consider viewing other than under the once-every-four-years heading of the Olympics. Why is that? Perhaps that is somehow a measure of my shallowness as a sports fan. Nevertheless, I was truly on the edge of my seat watching the women’s team archery semi-finals and finals. Great drama. Wonderful competitors. Exceptional skills. Bravo ladies! Another thing that I find fascinating about the Olympics is the fact that it brings together such a broad range of people. No, I’m not going to trail off in a chorus of Kumbayah. You simply cannot deny, however, that during the opening ceremonies you see people of every possible color and shade, from every corner of the planet, straight hair, curly hair, black hair, blonde hair, red hair, eye colors to fill a rainbow, and most startlingly, such an amazing collection of body types. These are all world-class athletes and yet they’re often so different from each other. I like seeing the six-foot-seven volleyball player walking next to the four-foot-ten gymnast. I like seeing the contrast of the marathoner and the shot-putter. We’re all the same species, but, my goodness, we come in an amazing array of shapes and sizes and various accoutrements. Note that is list is nowhere close to being comprehensive. 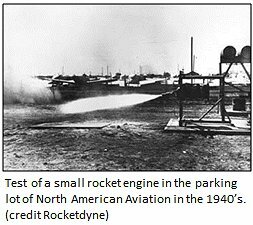 There are lots and lots of rocket engines out there including those currently in development or in production and many that have been retired (like the F-1A in the table). And if you open the window a little wider to include engines originating from beyond our shores, then you’ve got many more Soviet/Russian, European, Japanese, and Chinese engines to consider. All I want to do here is expose you to some basic yet significant differences between this small set of examples. Interestingly, if you can understand these few engines, then you can understand most of rest of the ones out there as variations on these basic themes. Please allow me to introduce you to the engines listed in the table. • Of course, the J-2X needs no further explanation for anyone who reads this blog regularly. • The RL10 is a small engine that has been the product of Pratt & Whitney since the late 1950’s. Over the past sixty years it’s evolved and matured. It was actually used on a NASA vehicle back in the 1960’s, the Saturn I launch vehicle upper stage (S-IV). 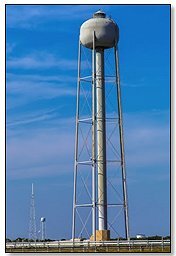 Today it’s used, in different variants, as an upper stage and in-space engine for both the Atlas V and Delta IV launch vehicles. 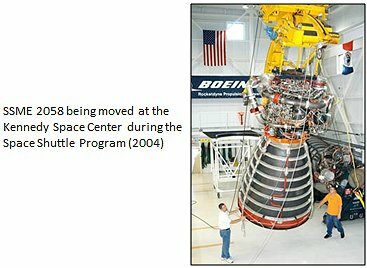 • The RS-25 is another name for the Space Shuttle Main Engine (SSME). 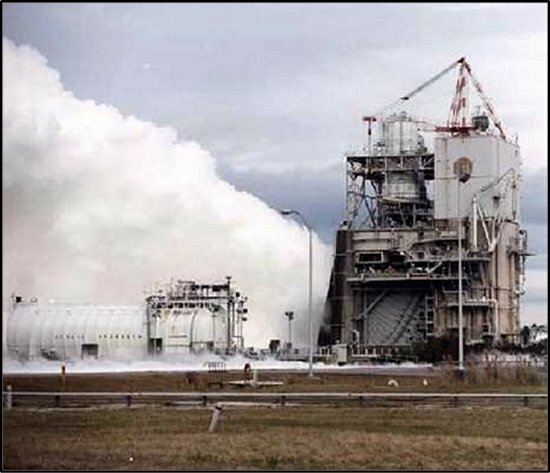 The development of the SSME began with research efforts in the late 1960’s, using a great deal of knowledge gathered from the development of the original J-2, and it was first tested in 1975 and first flew on STS-1 in 1981. 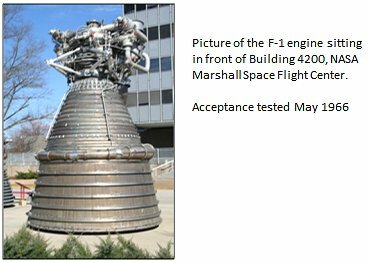 The RS-25 engine is now designated to be the core stage engine for the next generation of launch vehicles under the Space Launch System (SLS) Program. • The F-1A was an upgraded version of the F-1 engine that powered the first stage (S-IC) of the mighty Saturn V launch vehicle that first took man to the Moon. The F-1A was a more powerful version of the F-1 with a handful of design changes intended to make it cheaper yet more operable and safe. 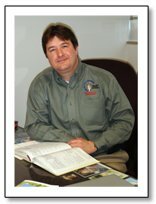 In a blog article here over a year and a half ago, I introduced you to the gas generator cycle engine. 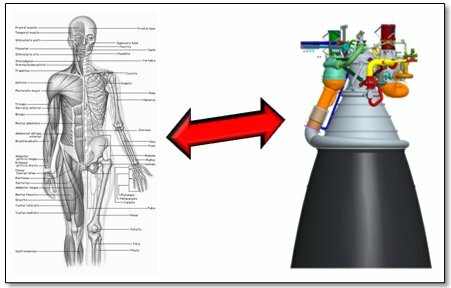 The key philosophical point discussed in that article about what makes a rocket engine an engine is the fact that it feeds and runs itself. It does this by finding a means for providing power to the pumps that move the propellants. The origin for this power is the key to any rocket engine cycle. In a gas generator engine, this power is generated by having a separate little burner that makes high-temperature gases to run turbines that makes the pumps work. Below is a schematic for such a system. You’ve seen this schematic before and it is very much like J-2X. The F-1A power cycle is similar to the gas generator cycle shown above in that it is still a gas generator cycle, but rather than two separate turbopump units, there was only a single (huge) unit that contained both pumps. So, a single turbine was used to power both pumps rather than having two separate turbines like J-2X. Going back to the table, you will see that the F-1A was different from the J-2X also in the fact that the propellants were different. The J-2X uses hydrogen for fuel and the F-1A used RP-1 (FYI, RP-1 stands for “rocket propellant #1” and is actually just highly purified, high quality kerosene). The chief difference between hydrogen and kerosene is chemistry. 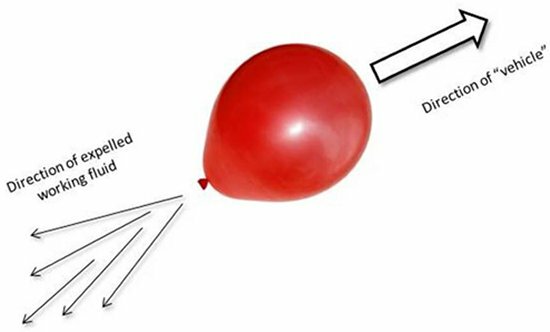 A hydrogen-fuel engine will get higher specific impulse than a kerosene-fuel engine but kerosene engines have the distinct advantage of being able to generate more thrust for a given engine size. With a kerosene engine, you are simply throwing overboard more massive, high-velocity propellants in the form of combustion products. Hydrogen is light and efficient from a “gas mileage” perspective but kerosene gets you lots and lots of oomph. That’s why you typically use it for a first stage application like on the Saturn V vehicle. You want to have lots of oomph to get off the ground. Later, on the upper stages, you can better use the greater gas mileage afforded by hydrogen. Note, however, that you could theoretically build a hydrogen engine as large as the F-1A in terms of thrust. The RS-68 (also a gas generator cycle engine) on the Delta IV vehicle puts out around three quarters of a million pounds-force thrust so that’s pretty big. 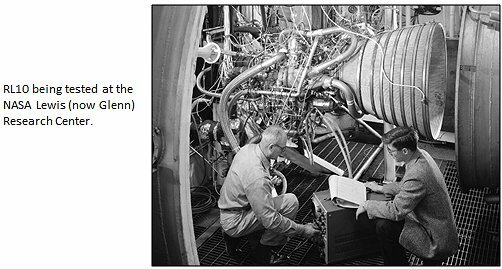 Also, back in the 1960’s, there was conceptual design work performed on an enormous hydrogen fuel, gas generator cycle engine called the M-1. 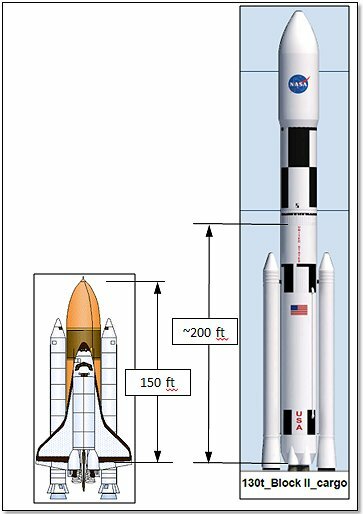 On paper, that behemoth put out 1.5 million pounds-force of thrust just like the F-1 on the Saturn V. But that project was abandoned and here’s why: hydrogen is very, very light so if you want to carry any appreciable amount, you need to have truly huge tanks. Huge tanks mean huge stages. Huge means heavy. Eventually it becomes a game of diminishing returns at the vehicle level. 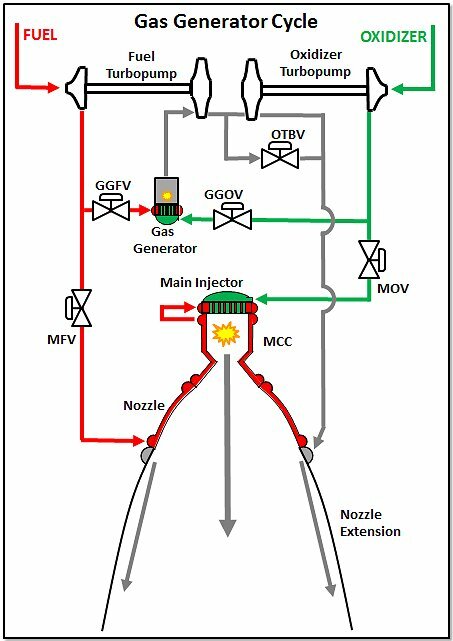 What this discussion of J-2X and F-1A (and RS-68 and even M-1) shows you is the extreme versatility of the gas generator cycle. It can be used with nearly any reasonable propellant combination and it can be scaled from pretty darn small to absolutely enormous. 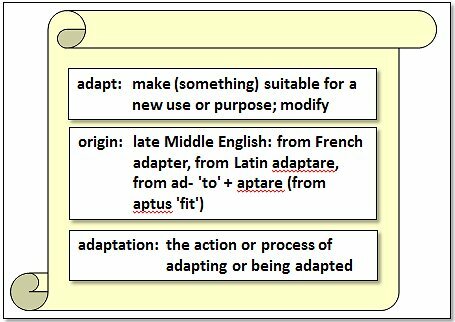 Occam’s Razor is the notion that one should proceed with simplicity until greater complexity is necessary. Along these lines, I will introduce you to a simpler engine cycle: the expander cycle. 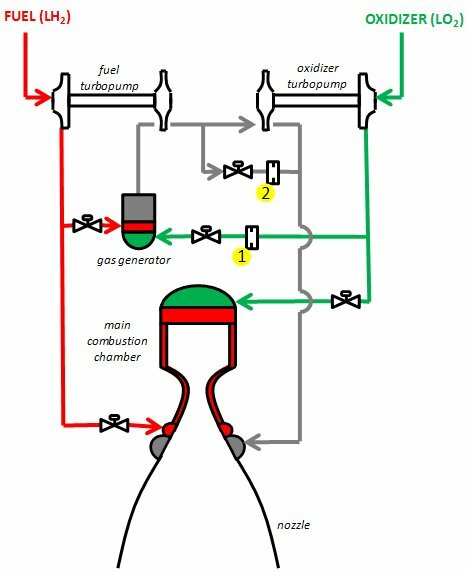 For this engine cycle, you do not use a gas generator to drive your turbine(s) so you don’t have a second, separate combustion zone apart from the main combustion chamber. That makes everything simpler. 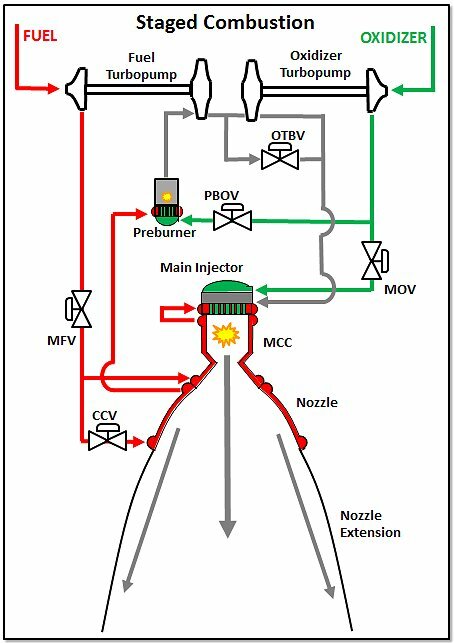 Instead, you use only the heat gathered in the cooling the thrust chamber assembly (i.e., the main combustion chamber walls and that portion of the nozzle regeneratively cooled). See the schematic below. See? I got rid of not just the gas generator but also the two valves that fed the gas generator. That’s huge in terms of simplification. And whenever you can make an engine simpler you’ve usually made it cheaper and more reliable just because you have fewer things to build and fewer things that could break. Cool! Here, however, is the problem: How much power do you really have just from the fluid cooling the walls? The answer can be found by looking at the table and seeing, for example, the RL10 thrust output is less than one-tenth of J-2X. You just can’t pull that much energy through the walls. There have been attempts to increase heat transfer by various means including making the main combustion chamber longer than typical so that you have more heat transfer area or even by adding nubs or ridges onto the wall to gather up more heat. 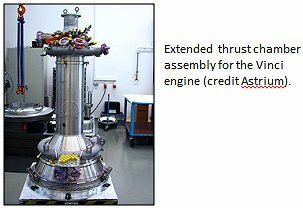 Using the longer chamber notion, the European Space Agency is working on an engine called the Vinci that almost doubles the thrust output from the RL10, but getting much further beyond that is darn tough. Also note that hydrogen is a wonderful coolant based upon its thermodynamic properties. Being a wonderful coolant means that it picks up a lot of heat. 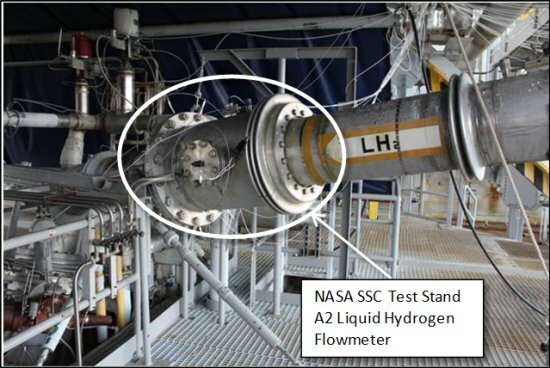 It is difficult to imagine using the expander cycle engine with another fuel beside hydrogen (though maybe methane might work … haven’t examined it). 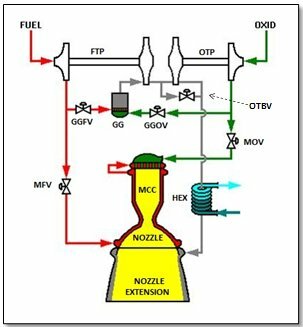 On the plus side, in addition to the simplicity, what the cycle shown offers is what is called a “closed cycle” meaning that no propellants are thrown overboard other than through the main injector. In a gas generator cycle engine, after the gas generator combustion gases pass through the turbine(s), it’s dumped into the nozzle (or, in other schemes, dumped overboard in other ways). 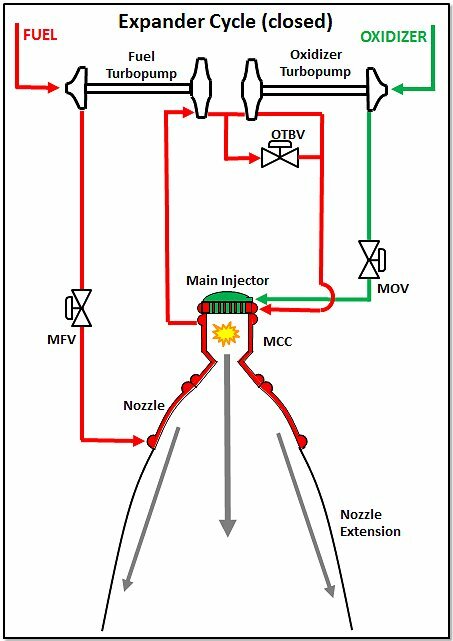 Any propellants or combustion products that do not exit the rocket engine through the main injector and through the main combustion chamber throat represent an intrinsic loss in performance. “But,” you’ll say, “the specific impulse for the RL10 and the J-2X in the table are the same.” Well, that’s a little bit of apples and oranges because it’s based upon the nozzle expansion ratio. Another model of the RL10, the B-2, has a much larger nozzle extension and the vacuum specific impulse for that model is over 462 seconds (minimum). The European Vinci engine that I mentioned above has a projected vacuum specific impulse of about 465 seconds. Those are darn impressive numbers that make the mouths of in-space stage and mission designers drool. 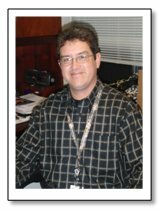 A couple of final notes about the expander cycle engine. First, the RL10 is not quite like the schematic shown. It only has one turbine with one pump driven directly and the other pump driven through a gear box. Thus, the OTBV goes away (making it even simpler!). Second, there are versions of the expander cycle engine concept that are not closed cycles. In these versions, you dump the turbine drive gas overboard in a manner similar to what you do in a gas generator cycle. You are still using the heat from the chamber walls to drive the turbine(s), so it’s still an expander, but with an overboard dump you can also leverage a larger pressure ratio across the turbine(s) and thereby get a bit more oomph out of the cycle. You sacrifice a bit of performance for more oomph. The Japanese LE-5B engine is an open expander cycle engine like this (also called an “expander bleed” cycle). So, you’ve seen the incredibly versatile gas generator cycle engine. And, you’ve seen the simple yet limited expander cycle engine. So what do you do if you say, “The heck with it, I want the Corvette”? What if you want a closed cycle, high performance engine not limited to lower thrust levels and you’re willing to accept consequent greater complexity? The answer is staged combustion. Below is a simplistic schematic for a staged-combustion engine. 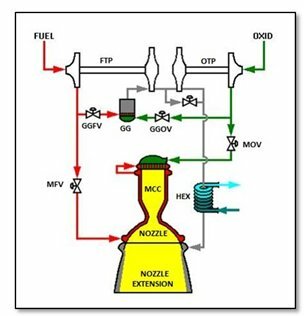 In a staged combustion cycle engine, we rename the gas generator and call it the “preburner.” The biggest difference between a gas generator cycle and a staged combustion cycle is what you do with the turbine exhaust gases. In a gas generator cycle, the turbine exhaust gases effectively get dumped overboard. In a staged combustion cycle, the turbine exhaust gases get fed back into the main injector and get “burned again.” This is possible since the combustion in the preburner is off from stoichiometric conditions, meaning that in addition to combustion products you also have lots of leftover propellant (either fuel or oxidizer depending on the scheme). The leftover propellants from the turbine exhaust then become part of the mix of propellants in the main combustion chamber. That sounds simple, right? It’s just a twist on the gas generator cycle theme, right? Well, there are larger implications. First, think about the pressure drops through the system. On a gas generator cycle engine, the pressure in the gas generator can be lower than the main chamber. After all, the downstream side of the turbine(s) is effectively ambient, external conditions. 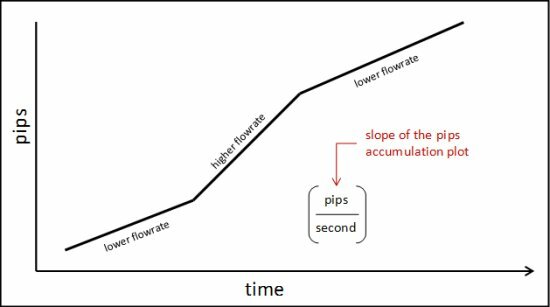 In a staged combustion cycle, the preburner pressure has to be substantially higher than the main chamber pressure sitting downstream of the turbine(s) or you don’t get enough flow to power the turbine(s). 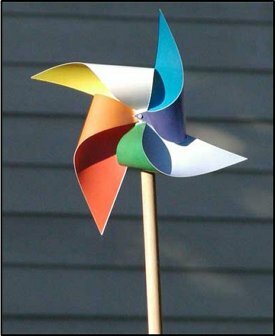 Insufficient turbine power and the cycle doesn’t work. So, in general, a staged-combustion cycle engine has higher system pressures than a gas-generator cycle engine of comparable size. 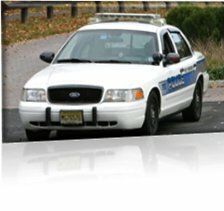 Next, think about starting the system. In a gas generator cycle engine, the two combustion zones are effectively disconnected. In a staged combustion cycle engine, the two combustion zones are on either side of the turbine(s) so there is effectively communication between these two zones. Now, try to imagine getting these two combustion zones ignited and up to pressure and the turbine(s) spun up to speed in an orchestrated manner during the start sequence. It ain’t easy. 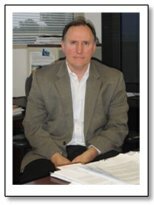 So, what do you get for this complexity and higher operating conditions? Well, you get a closed cycle, high performance, and high thrust engine design choice. The RS-25 (SSME) is the American example of such an engine. 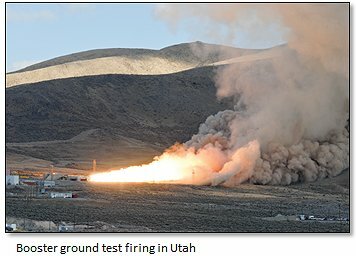 If you put a higher expansion ratio nozzle on the RS-25, just as with the RL10 discussion, the specific impulse value would be as much as ten seconds higher than J-2X. However, if you go out and find a schematic of an SSME, what you’ll see is a heck of a lot more complexity than even I’ve shown in my simplified sketch. Because the pressures are so high, there are actually four separate turbopumps and a boost pump in the SSME. 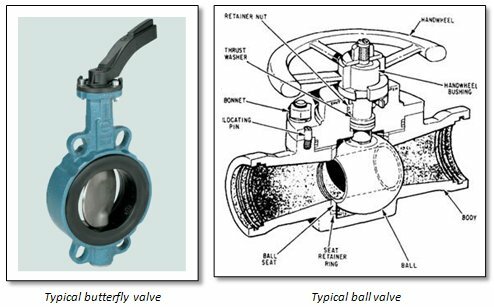 The design relies on putting pumps in series to achieve the necessary pressures and fluid flow rates through system. 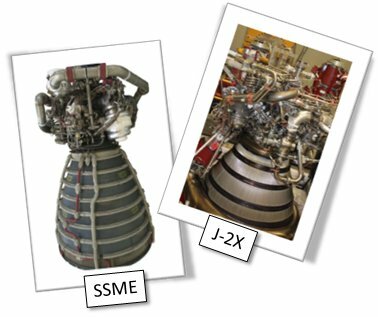 And, the SSME has not one but two separate preburners, one for the high pressure fuel turbopump and one for the high pressure oxidizer turbopump. It’s a very complex engine, but it has extraordinary capabilities. 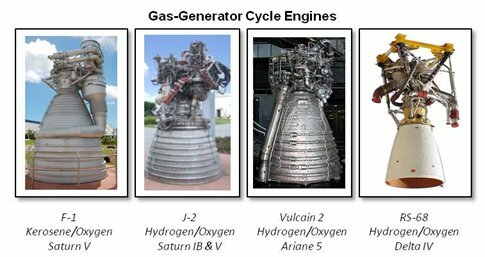 The RS-25 (SSME) is a staged combustion cycle engine with hydrogen as the fuel. The preburners are run fuel-rich such that the generated gases contain excess hydrogen for injection in the main chamber. Back in the days of the Soviet Union, they developed a whole series of staged combustion cycle engines that instead used kerosene as the fuel. In these engines, the preburner is run oxidizer-rich so that the gases run through the turbines and then through the main injector have excess oxidizer to be used for final combustion in the chamber. 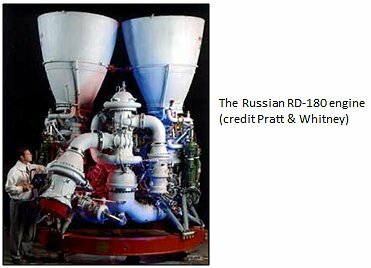 The Russian-supplied RD-180 that is currently used for the Atlas V launch vehicle is an example of such an engine. It too is an extremely complex, high pressure, and high performance engine. So, staged combustion cycle engines are not easy. Their complexity and operating conditions suggest, generically, greater expense and lower reliability. 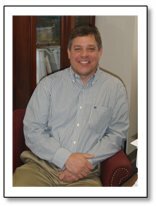 But if you can make the trade-off between high performance and the adverse issues, then they can function quite impressively. 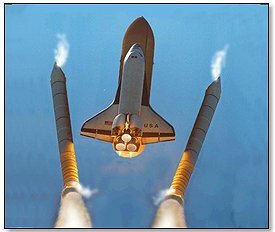 Nearly thirty years of Space Shuttle flights are an indisputable demonstration of this fact. Can you imagine opening a hardware store and selling just one kind of bolt? That would be it. One brand. One diameter. One length. And just one bin full of identical versions of this one bolt in your store. It sounds really kind of stupid. The unavoidable truth is that you need different bolts for different applications. It’s kind of like trying to imagine telling the Olympic gymnastics team that they now had to play basketball and the basketball players to do gymnastics. I don’t know about you, but I’d love to see Lebron James have a go at the pommel horse. 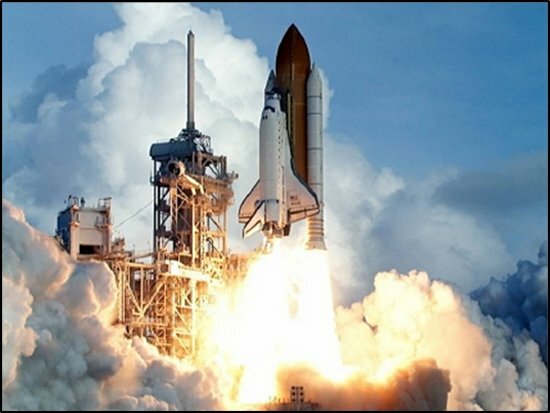 Well, over the last fifty-plus years, we’ve developed different rocket engines and rocket engine concepts for a variety of different applications. Just one design does not fit all applications. Each design has advantages and disadvantages. If you can understand the basics of what I’ve discussed in this article, however, then you will have a fundamental understanding of at least 90% of the engines spanning that fifty-plus years of history. And that, in turn, might help you better appreciate why one bolt is chosen over another or why, for example, shot-putters tend to be a bit more beefy than cyclists.